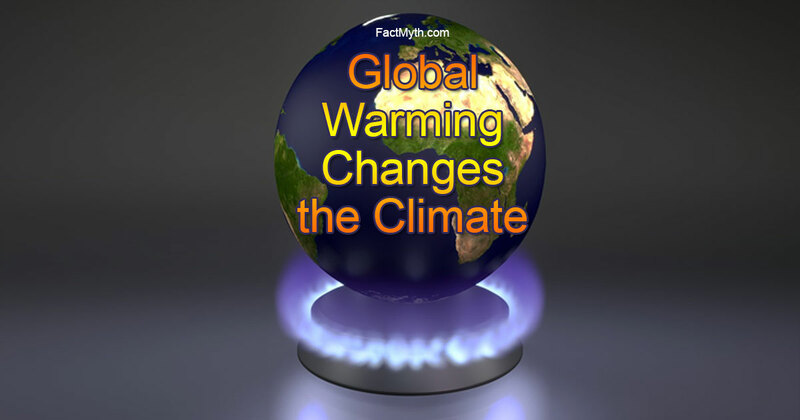 Climate Change is Different than Global Warming - Fact or Myth? Climate change and global warming are different. 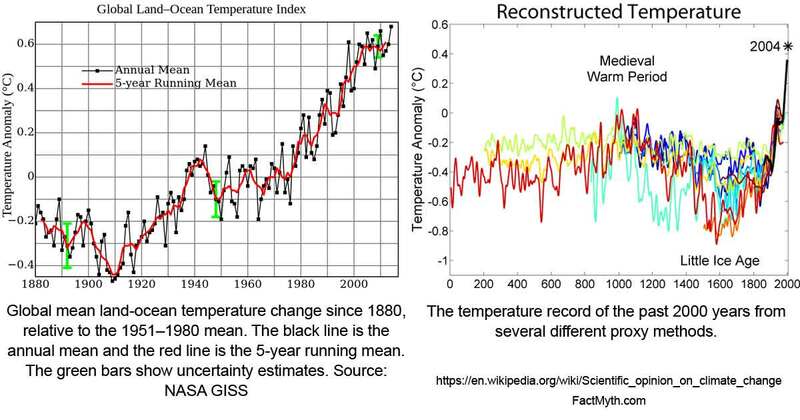 “Global warming” describes an increase in the earth’s average temperature, “climate change” describes all changes to climate, including global warming. Climate change is the big picture, global warming is part of climate change and the main contributor to climate change. Since global warming is the primary factor in climate change, the words can sort of be used interchangeably in common language (much to the confusion of the listener). For example: When greenhouse gasses warm the atmosphere, and that melts ice caps, the warming is global warming and the ice cap melting is climate change (an effect of global warming). We can say global warming and imply climate change effects, or we can say climate change and imply global warming. The difference between global warming and climate change. FACT: Typically, the terms global warming and climate change imply human-caused climate change, but they can refer to natural climate change as well. FACT: Global warming may only be a type of climate change, but evidence shows that it’s the main obstacle in regards to negative human-caused climate change. Why Do We Use Both Terms? The main reason we use both terms is a matter of politics. This isn’t my politics, this is me literally telling you that (as you can imagine) there is a bitter war over whether the usage of fossil fuels and such has MEANINGFUL negative climate impacts. The debate is so heated everyone essentially decided to switch terms somewhere back in the early 2000’s. So just know, both climate change and global warming are technically different (and both real), but they are used interchangeably in politics like they aren’t. Frank Luntz, a political strategist, recommended the term to Bush in 2002. Al Gore had been a big proponent of fighting global warming while Bush feared the economic impacts. NOTE: Fighting climate change requires funding Government agencies and regulating energy companies. This somewhat naturally puts the American left on one side and the right on the other. This is compounded by parties “playing to the base”. The “right wing base” in America tends to not believe in climate change while the “left-wing base” does. Luntz on FOX News in 2009. FACT: Some “skeptics” prefer the term global warming. On one hand, that is the primary issue. On the other hand, it’s advantageous for debate as they only need to combat the warming concept (which is easy using the “false-logic” that global warming isn’t happening if it’s cold outside). Essentially the semantics of using Global Warming and Climate Change are rooted in American politics. Are Global Warming and Climate Change Caused By Humans or Natural? For better or worse, when humans impact the climate, they create human-caused climate change. When the effects of human-caused climate change result in disasters like a record number of wildfires for 2015  , or the melting of the polar ice caps   , it’s negative human-caused climate change. That said climate change and warming aren’t always “bad”. Are Global Warming and Climate Change Bad? If I turn the AC up in my house I am changing the climate. If we were in an ice age warming up the earth a few degrees would be nice. If we are in a hot period, dropping the temperature a few degrees globally could actually be a good thing. Any time we alter our climate, it’s climate change, any time we use greenhouse gasses to trap heat we change the climate. Climate change and global warming are good in some circumstances but bad in others. The above said when we say “climate change” in a national or international discussion we are talking about negative human-caused climate change, and specifically global warming. There are two schools of thought. One school believes that the data above points to global warming and climate change. The other calls into doubt the accuracy of the data and says that weather patterns are non-deterministic and to whatever extent data is showing a changing climate it’s natural. Skeptics say that humans can’t impact climate in a meaningful way and that scientists are conspiratorial; the other side says the data is clear and climate change is real. Learn more here. 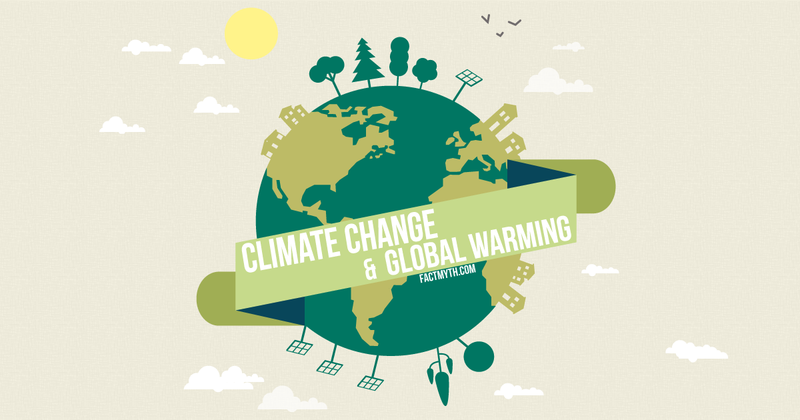 Climate change and global warming are two different things, but they are very closely related. Global warming is the average warming of the earth, climate change is global warming, it’s effects, and all other climate changes. The words climate change and global warming often imply the ill effects associated with them, but they are technically natural words simply describing a phenomena natural or human caused. “Climate Change: Critical Concepts in the Environment, Volume 1“. Books.google.com. Retrieved Feb 6, 2016. “Scientific opinion on climate change“. Wikipedia.org. Retrieved Feb 6, 2016. “Causes of Climate Change“. Epa.gov. Retrieved Feb 6, 2016. “Ten Facts & Ten Myths On Climate Change“. Rense.com. Retrieved Feb 6, 2016. “Global Warming Helped Exacerbate Biggest Year Ever for U.S. Wildfires“. Scientificamerican.com. Retrieved Feb 6, 2016. “The consequences of climate change“. Climate.nasa.gov. Retrieved Feb 6, 2016. “Global Warming“. Nrdc.org. Retrieved Feb 6, 2016. “Frank Luntz“. Wikipedia.org. Retrieved Feb 6, 2016. “Pollster Frank Luntz Releases New Polling Results: Bipartisan Public Support for National Climate Legislation“. Edf.org. Retrieved Feb 6, 2016.